Join us on Sunday, May 7, from 6:30-8:30 pm at the Marjorie Mews Library for the 2017 Annual Pre-Conference Social with refreshments and snacks. Julia Mayo, Branch Supervisor, and Kristina Walters, Library Assistant, will also tell us what’s happening at the Marjorie Mews library. Libraries both big and small are integral parts of their communities. 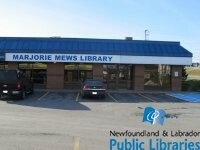 At Marjorie Mews Public Library we feel that we fill that role well because of the staff and the attitude we have. We believe that by having ownership of our “product” and having a positive attitude about our work, there is nothing we cannot achieve. It is our philosophy; if you are not having fun (at work) you are doing it wrong. We work hard to create positive partnerships within the community with businesses, schools and other community groups. Over the years we have steadily continued to push the limits of our space, our budget and our imaginations to bring in programs that appeal to our patrons and their families. Kristina and Julia have been working with the Newfoundland and Labrador Public libraries for about nine years. They find great satisfaction in doing all kinds of library work, from answering reference questions, coordinating adult programs and basic computer classes to early literacy outreach and children’s story time. To register and find out more about our upcoming annual conference, please visit our webpage or contact planning committee chair, Kate Shore. Posted in Annual Conference, Events, Public Libraries. Bookmark the permalink.